The First Act is one of my favorite parts of any story. Why? On the surface, the First Act seems to be the slowest part of the story—and it often is. It’s just setup, after all, right? True enough, except for that one little word just. It isn’t “just” setup; it’s SETUP! It sets up the plot, but even more importantly, it sets up the character arcs. As you’ve already seen in the previous six parts of this series, the setup necessary just to prepare for your First Act is pretty intensive. But once you’ve got the prep work of deciding upon the Lie Your Character Believes, the Thing He Wants, the Thing He Needs, his Ghost, his Characteristic Moment, and his Normal World (phew!) out of the way, the First Act itself is comparatively simple to piece together. The First Act introduces the conflict, but the protagonist won’t fully engage in it until the First Plot Point at the beginning of the Second Act (more on that in a bit). 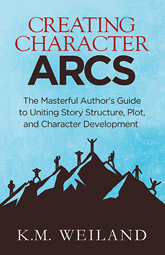 With a few notable exceptions, the structure of character arc is much more flexible in its timing than is the structure of plot. Below are six major elements of the positive change arc that need to be included in the First Act, but most of these elements can happen just about anywhere within that first quarter of your book. Use your understanding of your story and its necessary pacing to help you time the key moments in your character’s arc. This reinforcement should continue throughout the First Act. Your character’s Lie may have several facets, so feel free to take your time introducing each of them. You don’t have to cram everything into the first chapter. Hook readers with a glimpse of the character’s problems, then use the rest of the First Act to fill in the gaps. For example, Thor’s Lie is practically handed to him by his father who tells him straight out he was born to be king. Right from the beginning, readers need to see even a teeny promise that your character possesses the capability to change. What specific quality will be intrinsic in your character’s ability to fight his way out of the Lie (refer to Angela Ackerman and Becca Puglisi’s Positive Trait Thesaurus for inspiration)? Even if your character hasn’t yet fully developed this trait, hint right from the beginning that the seed is there. In Toy Story, Woody’s ability to be a good friend is on display right from the start in his caring attitude toward the other toys in Andy’s room. This doesn’t necessarily mean he takes the first step in changing. This is still the First Act, after all, and the character is still a long ways from even being able to admit he has a problem. But that doesn’t mean you can’t start laying the groundwork. He can’t change unless he first knows how to change. The First Act is the place to begin foreshadowing that change by giving the character a hint or two about the nature of his Lie and—even more specifically—the Truth he’ll need to learn in order to counteract it. In What About Bob?, Bob’s cure (love and family) are strongly foreshadowed through his immediate connection with Leo’s family photographs. 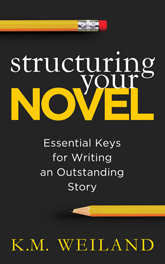 The sturdiest place for your story’s inciting event is halfway through the First Act. This timing gives you the opportunity to introduce your character and his world before hitting him flatout with the inciting event. Note this does not mean the previous events will be unrelated to the main plot. Everything builds into everything—if only through foreshadowing. Think of the inciting event as an opportunity for your character. On the surface, it may be something awful (like a declaration of war). But it’s too late! The inciting event has already changed the character. In ever so small a way, it has changed his awareness of himself, his world, and his problem. For the first time, he begins to realize he has a problem. He probably won’t be able to name that problem just yet. But suddenly he’s got an itch. The familiarity of his old world isn’t quite so comfortable anymore. In Jurassic Park, Alan Grant’s first response to John Hammond’s preposterous offer is to turn him down flat. He gets over it quickly enough when Hammond raises the stakes, but his initial reluctance is important. Toward the end of the First Act, the character will still be entrenched in the Lie. He believes in it just as strongly now as he did at the beginning of the story. But, on a subconscious level, he is beginning to fight against its foundation. As a result, his belief in how he serves the Lie begins to evolve. For example, he may still believe money is power, but he now believes he can gain that money honestly instead of working as a con man. At the end of the First Act, Jane Eyre still believes she has to serve to be worthy of love. But she decides she’d rather strike out on her own and take service as a governess, rather than continue drudging as a teacher at Lowood School for Girls. The First Act ends when the character makes a decision—and not just any decision. He decides he’s going to do something about that annoying inciting event that bumped into his life a few chapters back. In essence, he is deciding to step through the doorway between worlds. He’s about to leave his Normal World (perhaps literally, perhaps metaphorically) and enter a brand new world of adventure, full of challenges he’s never before faced and which he will never again be the same after having overcome. This will propel him into the First Plot Point, which we’ll discuss in the next post. At the end of the First Act in Secondhand Lions, Walter decides to return to live with his uncles. It isn’t a passive decision on his part. It’s an active choice, which makes him a willing resident on the farm for the first time in the story. A Christmas Carol by Charles Dickens: Scrooge’s Lie is reinforced throughout the First Act in a series of encounters, first with his nephew and his employee Bob Cratchit, then with the men collecting for the poor, the carolers, and, finally and most dramatically, with the ghost of Jacob Marley. We see the tiniest glimmer of a possibility for change in the real warmth of friendship that momentarily springs up in Scrooge in response to Marley. As for Marley, he doesn’t just hint at what Scrooge needs to do to change; he spells it out in gory detail. Marley’s warning is the inciting event, which Scrooge scoffs at, even in the light of such convincing proof as a real live ghost. Still, he is shaken, and a small part of his brain begins to wonder if Marley’s promise of damnation might be true. He decides to stay awake until after the prophesied hour of the first ghost—just to prove to himself how crazy the whole thing is. Cars directed by John Lasseter: Lightning McQueen’s Lie is set up in the lengthy opening race sequence, then reinforced consistently by his attitude throughout the First Act. We see a glimmer of hope for him in his friendship (such as it is) with his transport truck Mack, the only team member he doesn’t seem to resent. Racing legend The King spells out the advice Lightning needs to hear about getting himself a “good team”—even though Lightning mostly tunes it out. The announcement of the tie-breaker race, to be held in California, is the inciting event. Lightning embraces it wholeheartedly, but, without yet knowing it, he simultaneously rejects the “adventure world” he’s about to land in, when he scorns his rundown Rust-eze sponsors. Lightning decides to travel all night to reach California in time to schmooze the new sponsor he hopes to gain. 1. How will you introduce and reinforce your character’s Lie in the First Act? 2. How will you use the “elbow room” in the First Act to space out the various layers of your character’s Lie, goals, and personality? 3. How will you indicate your character’s latent potential to overcome the Lie? 4. What aspect of the Truth can you share with the character in the First Act? How will you share it (through another character’s mentoring, etc.)? 5. What will be your inciting event? 6. Why will your character initially reject it? 7. How quickly will your character get over his initial rejection of the inciting event’s “call to adventure”? 8. Toward the end of the First Act, how will your character’s belief in how he serves the Lie begin to evolve? 9. What decision will the character make that will engage him in the inciting event?